A new Transparency Market Research report states that the global elderly and disabled assistive devices market was valued at US$12.3 bn in 2012 and is predicted to reach US$19.6 bn by 2019. It is expected to expand at a CAGR of 6.90% between 2013 and 2019. The title of the report is “Elderly and Disabled Assistive Devices Market - Global Industry Analysis, Size, Share, Growth, Trends and Forecast, 2013 - 2019”. As per the report, the increasing disabled population and geriatric population, rising funding by governments, and launch of new cutting-edge products including powered wheelchairs, implants, sensor-based door openers, and portable reading machines have fuelled the market for elderly and disabled assistive devices. On the other hand, the expansion of the market may be inhibited in the coming years due to rising product prices. For instance, advanced hearing aids such as bone anchored aids cost about US$10,000 per device at present.The report segments the elderly and disabled assistive devices market on the basis of type, product, and geography. On the basis of type, the market is segmented into medical mobility aids and ambulatory devices and medical furniture and bathroom safety products. Medical mobility aids and ambulatory devices include mobility scooters, wheelchairs, cranes and crutches, transfer lifts, door openers, walkers and rollators, and others including pillows, back supports, and cushions. On the other hand, medical furniture and bathroom safety products include medical beds, ostomy products, bars and railings, commodes and shower chairs, and others including pool lifts, bath lifts, hearing aids, and vision and reading aids. Hearing aids are further segmented into receiver-in-the-ear (RITE) aids, in-the–ear (ITE) aids, behind-the-ear (BTE) aids, cochlear implants, and bone anchored hearing aids. Vision and reading aids are further segmented into reading machines, braille translators, video magnifiers, and others including kitchen appliances and books. Amongst these types, in 2012, the segment of hearing aids held the biggest share in the elderly and disabled assistive devices market. This is owing to the huge number of people suffering from hearing impairments. As per the World Health Organization (WHO), approximately 5% of the population of the world suffers from hearing loss. On the other hand, the segment of medical mobility aids and ambulatory devices is the second biggest segment and is predicted to exhibit expeditious growth in the forecast horizon. On the basis of geography, the market is segmented into Europe, North America, Asia Pacific, and Rest of the World (RoW). 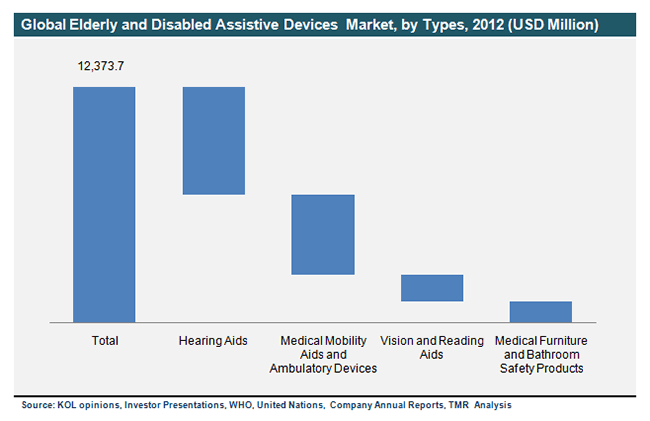 Amongst these, in 2012, North America held the biggest share in the elderly and disabled assistive devices market. On the other hand, Asia Pacific is expected to experience the highest growth rate during the forecast horizon and is predicted to rise at a 6.0% CAGR. This is due to the rise in the disabled and elderly population, increasing disposable incomes, and rise in government funding.According to the report, the prominent players dominant in the market include William Demant Holding A/S, Sonova Holding AG, Sunrise Medical LLC, Invacare Corporation, Ai Squared, and GN ReSound Group, among others.